Training In Flower Arrangement And Ikebana is an event that took place between 14-Feb-2006 and 17-Feb-2006 in Hyderabad. If you think it doesn't take much to make a flower look beautiful, try talking to someone who practices Ikebana. This complex and beautiful Japanese art of flower decoration is steeped in symbolism but has a dainty and virgin look that can be appreciated even by the uninitiated eye. The Agri - Horticultural society  is conducting training classes in both Ikebana and western flower decoration at the Public Gardens, from the 19th to the 22nd of this month. Ms.Usha Bhagya and Ms. Rekha Reddy, both accomplished flower arrangement experts, will conduct these classes that will last from 11 a. m. to 2 p. m. everyday. The classes are being co-ordinated by Mr. A. Satyanarayana, and the chairman is Mr. Hemchander. This class will introduce the students to Ikebana and Western flower arrangements, and also teach the basic skills required to make bouquets. For more details, please contact 2329-9779 / 5559-1474. 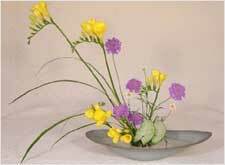 Be the first to comment on Training In Flower Arrangement And Ikebana! Just use the simple form below. fullhyd.com has 700,000+ monthly visits. Tell Hyderabad what you feel about Training In Flower Arrangement And Ikebana!